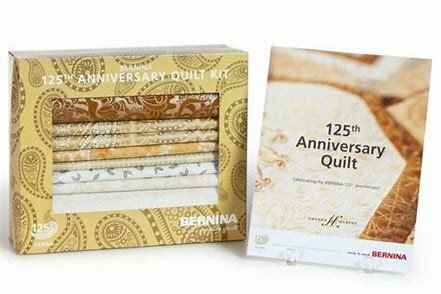 This gorgeous golden quilt was designed to celebrate Bernina's 125th Anniversary. But whether you own a Bernina or not, this quilt will be one you love. Blocks are pieced and trimmed in gold paisley, and surrounded with darker gold trails and white edging. The white back grounds and corner stones are embroidered (or appliqued) with antique gold color thread, with hints of white.